Bhubaneswar: Odisha ruling BJD says PM Narendra Modi’s remarks on Mahanadi are not acceptable. BJD MP Pratap Deb in response to Modi’s Mahanadi comments says, Modi’s remarks are not acceptable, when Nitin Gadkari became Water Resources minister, the matter was already in Supreme Court and lawyer representing Centre had opposed the tribunal . 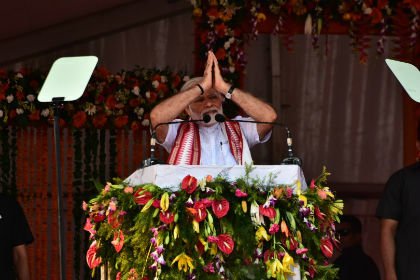 It should be noted that PM Narendra Modi adressing a public rally at Baljatra Ground in Cuttack says Maximum of Mahanadi’s water drains into Bay of Bengal; Centre had tried to resolve the problems but Odisha govt didn’t come forward. ; Nitin Gadkari had written to Odisha CM to resolve the water sharing dispute; our proposal to constitute a tribunal was also discarded . Targeting the state government on river Mahanadi water controversy, the PM said the state government is confusing poor people and farmers in the state. “The Centre tried to resolve the Mahanadi issue, but the state government did not cooperate. Half of the water of Mahanadi goes to sea, the state government admitted in the assembly. Why the lower Indra dam project is still halted even after 20 years back,” he questioned.